Metadata is information about information. For example, a book's title and author is metadata. Metadata can be many kinds of information -- a location, a date, or a catalog item number. When you use SharePoint products, you can manage the metadata centrally. You can organize the metadata in a way that makes sense in your business and use the metadata to make it easier to find what you want. This article describes some important terminology of managed metadata, and gives you a quick look at how you can use the tools in SharePoint to manage metadata. This section contains definitions of some key terminology. These terms and concepts appear frequently in articles about managed metadata. A taxonomy is a formal classification system. A taxonomy groups the words, labels, and terms that describe something, and then arranges the groups into a hierarchy. People construct taxonomies for almost any kind of information, from biological systems to organizational structures. For example, biologists group living organisms into four major classifications: animal, plant, fungus, and microbe. Each of these major groups has many subdivisions. Together, the whole system is a taxonomy. Organizations create taxonomies in too many ways to list. They create Chart of Accounts taxonomies to manage accounting systems, organization charts and job classifications to manage employees, product catalogs and so on. All these taxonomies are structured hierarchies of information; formal classification systems that help people handle information. A folksonomy is an informal classification system. It is evolves gradually as web site users collaborate on words, labels, and terms on a site. Originally, folksonomies developed from popular applications such as bookmarking. If you have ever seen a tag cloud on a website, then you have seen a visualization of a folksonomy. 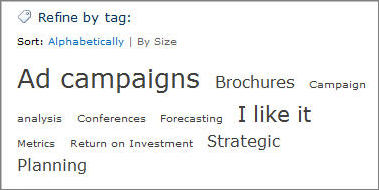 The following figure shows a tag cloud on a SharePoint site. A folksonomy-based approach to metadata can be useful. It creates a way to share the knowledge and expertise of site users. By using a folksonomy, content classification can evolve together with changing business needs and user interests. Terms sets can have different scope, depending on where you create the term set. 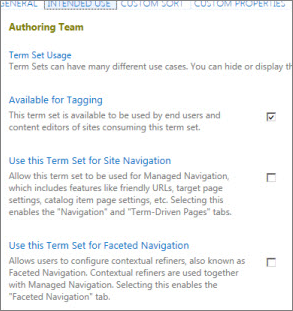 A term is a specific word or phrase that you associated with an item on a SharePoint site. It is a single item in a term set. A term has a unique ID and it can have many text labels (synonyms). If you work on a multilingual site, the term can have labels in different languages. Managed terms Managed terms are terms that are pre-defined. Term Store administrators organize managed terms into a hierarchical term set. Enterprise keywords An enterprise keyword is a word or phrase that a user adds to items on a SharePoint site. The collection of enterprise keywords is known as the Keywords set. Typically, users can add any word or phrase to an item as a keyword. This means that you can use enterprise keywords for folksonomy-style tagging. Sometimes, Term Store administrators move enterprise keywords into a specific managed term set. When they are part of a managed term set, keywords become available in the context of that term set. To learn more about how to create and manage terms, see Create and manage terms in a term set. In SharePoint products, group is a security term. With respect to managed metadata, a group is a set of term sets that all share common security requirements. Only users who have contributor permissions for a specific group can manage term sets that belong to the group or create new term sets within it. Organizations should create groups for term sets that will have unique access or security needs. To learn more about how to create a group for term sets, see Set up a new group for term sets. A Managed Metadata column is a special kind of column that you can add to lists or libraries. It enables site users to select terms from a specific term set. A Managed Metadata column can map to an existing term set, or you can create a local term set specifically for the column. The enterprise Keywords column is a column that you can add to content types, lists, or libraries to enable users to tag items with words or phrases that they choose. By default, it is a multi-value column. 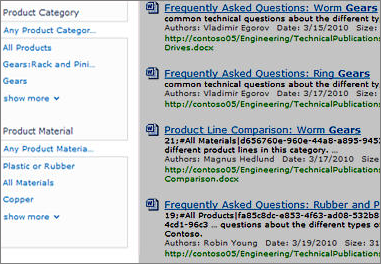 When users type a word or phrase into the column, SharePoint presents type-ahead suggestions. Type-ahead suggestions might include items from managed term sets and the Keywords term set. Users can select an existing value, or enter something new. To learn how to add a special keywords column, see Add an enterprise keywords column to a list or library. In a general sense, tagging refers to the act of applying metadata to an item, whether the tag is managed metadata or a social tag. SharePoint metadata management supports a range of approaches to metadata, from formal taxonomies to user-driver folksonomies. 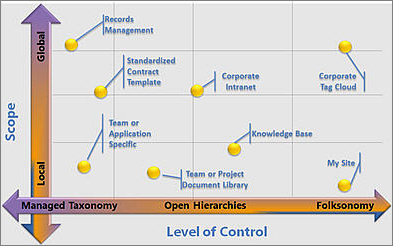 You can implement formal taxonomies through managed terms and term sets. You can also use enterprise keywords and social tagging, which enable site users to tag content with keywords that they choose. SharePoint products enable organizations to combine the advantages of formal, managed taxonomies with the dynamic benefits of social tagging in customized ways. The following diagram shows how different requirements might use different levels of scope and control. When the content across sites in an organization has consistent metadata, it is easier to find business information and data by using search. Search features such as the refinement panel, which displays on the left-hand side of the search results page, enable users to filter search results based on metadata. Metadata navigation for sites enables a site administrator to create navigation elements based on metadata terms. For more information including performance recommendations, see Navigation options for SharePoint Online. Metadata navigation enables users to create views of information dynamically, based on specific metadata fields. Then, users can locate libraries by using folders or by using metadata pivots, and refine the results by using additional Key Filters. To learn how to set this up, see Set up metadata navigation for a list or library and Use grouping to modify a SharePoint view. Managing metadata effectively requires careful thought and planning. Think about the kind of information that you want to manage the content of lists and libraries, and think about the way that the information is used in the organization. You can create term sets of metadata terms for lots of different information. Document purpose - Is it a sales proposal? An engineering specification? A Human Resources procedure? Your organization may want to do careful planning before you start to use managed metadata. The amount of planning that you must do depends on how formal your taxonomy is. It also depends on how much control that you want to impose on metadata. If you want to let users help develop your taxonomy, then you can just have users add keywords to items, and then organize these into term sets as necessary. The Term Store management tool provides a tree control that you can use to perform most tasks. Your user role for this tool determines the tasks that you can perform. To work on global terms in the Term Store management tool, you must be a global admin or SharePoint admin in Office 365, or a Term Store Administrator in SharePoint. To work on terms for a site, you can be a designated Group Manager or Contributor for term sets. For more information, see Create and manage groups and term sets. To take actions on an item in the hierarchy, follow these steps. Point to the name of the Managed Metadata Service application, group, term set, or term that you want to change, and then click the arrow that appears. Select the actions that you want from the menu. For example, if you are a Term Store Administrator or a Group Manager you can create, import, or delete term sets in a group. Term set contributors can create new term sets. At each level of the hierarchy, you can configure specific properties for a group, term set, or term by using the properties pane in the Term Store management tool. For example, if you are configuring a term set, you can specify information such as Name, Description, Owner, Contact, and Stakeholders in pane available on the General tab. You can also specify whether you want a term set to be open or closed to new submissions from users. Or, you can choose the Intended Use tab, and specify whether the term set should be available for tagging or site navigation.